It has now been 20 years since Le Porteur / The Star Keeper was created and began touring. 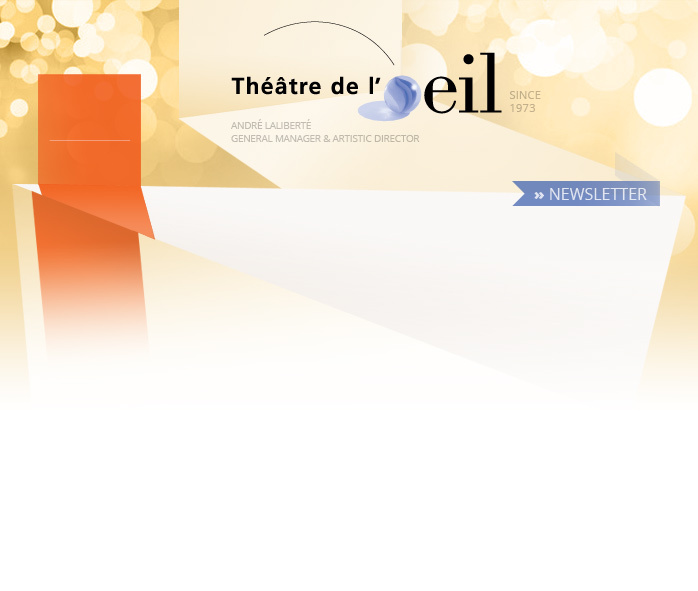 To mark this anniversary, Théâtre de l'Oeil wants to pay tribute to everyone whose hard work and commitment has made this possible: designers, artisans, puppeteers, technicians, stage managers, managers, marketing coordinators, presenters… This newsletter is dedicated to them. You might not remember, but the first time we met, it was already winter. November 25, 1997 in Ottawa. Just like today, it was cold out. As soon as I set eyes on you, I knew I would love you for many years to come. In the blink of an eye, you made me laugh, moved, delighted, charmed and entranced me. It was love at first sight. And it warmed my heart. I followed you around just like a groupie. Sometimes it was from a distance because you are quite the traveller. For 20 years now, you have been gracing stages around the world. You collect cities and countries as if they were beads in Daisy Bygone’s necklace, the little old lady whose bag you carry, you being the chivalrous worm that you are. I pinned so many tacks on the world map I have up on my wall that it looks more like a strainer now! And all that time I dreamed of the day when you would return. Besides Australia, is there any place you haven’t been? For 20 years, children’s starry eyes have sparkled. Your story is a great tale, the stuff of myth, or should I say legend. When I look at the press kit, your face is everywhere. You are a real star. There was even an article about you in The New York Times. For 20 years, your best (and most loyal) friends Jean Cummings and Graham Soul have breathed life into you at every chance they’ve had. And your stalwart stage manager Gilles Perron has been pulling your strings and bathing you in light. For 20 years, your biological father André Laliberté has been saying that you are a small miracle. I think he is right on the ball. Innocent though you may seem, you have changed so many people’s lives. Those who are close to you, those who come to see you, those who bring you to life, those who travel with you…and she who is writing to you now. When I am as old as Daisy Bygone, I hope you will be the one to come and take me to my place in the sky. And with a little star hanging over your shoulder. In 1993, André Laliberté got together with painter Richard Morin, scenographer Richard Lacroix, and puppeteers Guy Coderre and Jean Cummings to ask them to think about “image theatre”, a show without words based on a dream. “After all, we needed to be worthy of the name ‘Théâtre de l’Œil’!,” says André Laliberté, laughingly. Discussions, research and exploration went along nicely over the course of several months, and the initial outlines of a story took shape. We wrote and rewrote. First one storyboard then another. Richard Morin drew the puppets (here’s a scoop for you: Pretzel, The Star Keeper’s main character, is modelled after André Laliberté himself!). 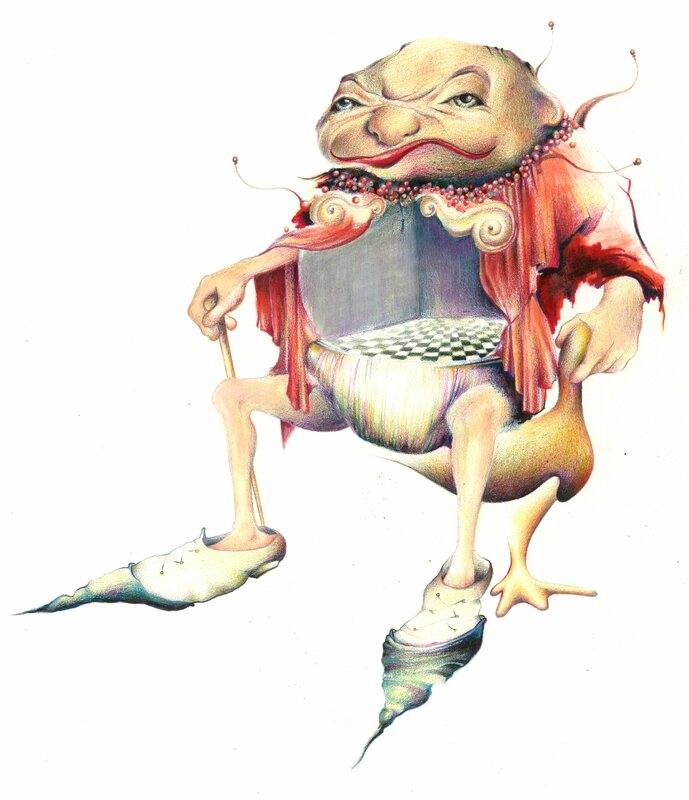 Richard Lacroix envisioned the puppet stage as a film set, the ideal setting for the creatures built by Jean Cummings (puppeteer who has been part of the show since its creation and has (almost) never missed a performance!). Finally, a first staged version in 1996. 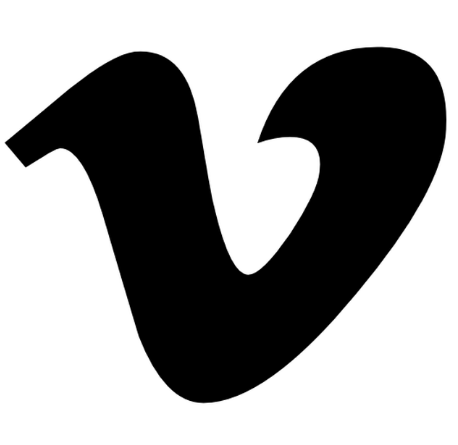 Here we could check whether the story and the staging worked, and we could resolve technical difficulties. A third storyboard emerged and the design became clearer. Preliminary rehearsals began in the summer of 1997, which helped us determine which images we wanted to include and gave composer Libert Subirana a chance to write the music that is so key in any show without words. In Théâtre de l’Œil’s workshop, artisans (Caroline Bourgeois, Jean Cummings, Catherine Jodoin, Olivier Perrier, Sylvain Racine, Claude Rodrigue and Graham Soul) were hard at work designing the mechanical devices, the costumes and the props. Then came rehearsals. “This was a crucial, make-or-break stage when the dream would take shape… or not,” says André. For two months, four puppeteers learned how to perform the array of characters and to manipulate the different kinds of puppets: string, hand, rod and Bunraku. The French version of The Star Keeper, Le Porteur, premiered on November 25, 1997 at the National Arts Centre in Ottawa. Four years spent researching and experimenting and “we had no idea how it would turn out,” remembers André. Le Porteur became The Star Keeper in the spring of 1999 and had its international début performance at the Kennedy Center in Washington (DC). Twenty years later, The Star Keeper has toured 15 countries on four continents, has given over 750 performances and has been seen by more than 150,000 people. 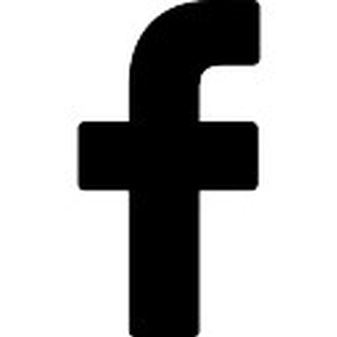 It has even been presented two or three times in the same festival or theatre over a period of several years. It has played twice at the New Victory in New York City, the second time as special guest to mark the theatre’s 20th anniversary. 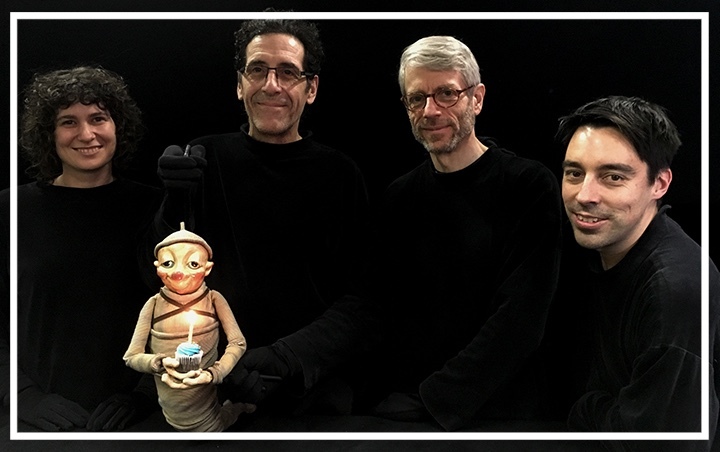 The show has been critically acclaimed and has received several awards along the way: the prestigious Chalmers Canadian Play Award, Theatre for Young Audiences in 2001, a Citation of Excellence in the Art of Puppetry from UNIMA-USA in 2005 and three Masques in 1999 from the Académie québécoise du théâtre: Best Production for Young Audiences, Best Set Design and Special Contribution for the puppet design. Puppeteers Jean Cummings and Graham Soul have been there right from the beginning and have been part of The Star Keeper throughout all these years. If you recall from the previous article, you’ll remember that Jean Cummings was part of the team that developed the idea behind the show. He was there at its birth! He helped build the puppets before bringing them to life on stage and accompanying them several times around the world. You could say that twenty years constitutes a true love story. Jean doesn’t deny it: “I really love The Star Keeper and the fact that it is a show without words. We’ve had amazing experiences while touring, especially in Spain and Ireland. Being able to perform the show overseas has been a dream come true and has more than fulfilled my wish to become a puppeteer. 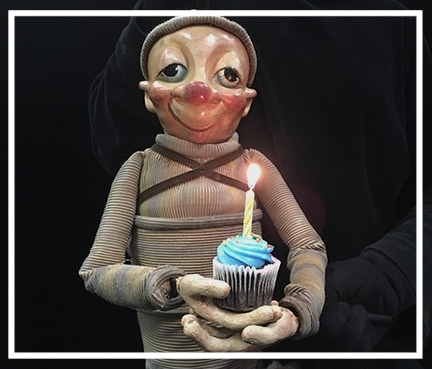 I hope to continue performing The Star Keeper for many years to come.” One of his most vivid memories is of a “disaster that turned into a miracle” when Pretzel lost his head during the show and Jean only had a few minutes to put it back on – in the dark and while wearing gloves! And he did it! Because Jean is a magician with extraordinary talent and he can do anything. But, because he is also very modest, he would say that’s a bit of an overstatement. He also remembers Daisy Bygone’s accident, a story that has since become a favourite with The Star Keeper crew [I myself have heard it several times, and still love listening to it]: “It was during a performance at the Maison des arts de Laval. I hung up the old lady Daisy Bygone, a string puppet, on a hook before going down from the bridge. Then I heard a weird noise, but I didn’t pay any attention to it. A little while later, my colleagues started whispering urgent messages to me like: ‘There’s a problem with Daisy Bygone, you’d better go see!’, ‘Go see the old lady, she doesn’t look well!’. The Star Keeper will be on stage at the Maison Théâtre in Montréal, from March 14 to 31, 2018. Quite a few of the 26 performances are already sold out, but there are still tickets. The Star Keeper will also make an appearance in Valleyfield on April 1, 2018. On February 25, 2018, Pretzel and his friendly band helped to inaugurate the Maison de la culture Claude Léveillée in the Centre Jean-Marie Gauvreau, located at 911 Jean-Talon Street. This is the same centre which houses Théâtre de l’Œil’s offices, workshop and rehearsal space. And this performance was, without a doubt, the one that required the least amount of travel ever: going down two floors in an elevator! the night and lighting the stars in the sky. heart is as fragile as Chinese porcelain. all bubbles that come within his reach.